For this pink-grapefruit-inspired look, I chose a peachy-pinky-bronze bonne mine powder for cheeks, a shimmery warm pink with a soft, warm-brown contour shade for eyes, and a bright pink lipstick to form a base stain for lips, with a pinky-orange gloss stick over the top. 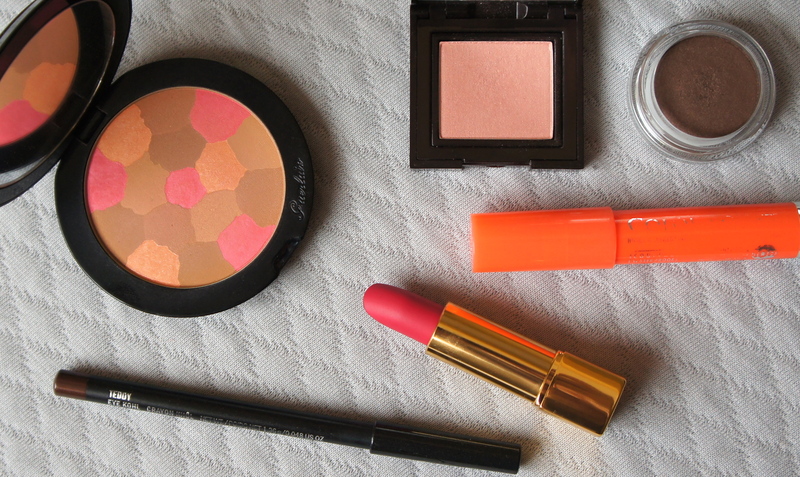 Clockwise from the far left: Guerlain Crazy Terracotta Healthy Glow Powder; Laura Mercier eyeshadow single in Crystal Beige; Clarins eyeshadow pot in Earth; Bourjois Colour Boost Lip Crayon in Orange Punch; Chanel Rouge Allure Velvet in L’Exuberante; MAC eyeliner pencil in Teddy. 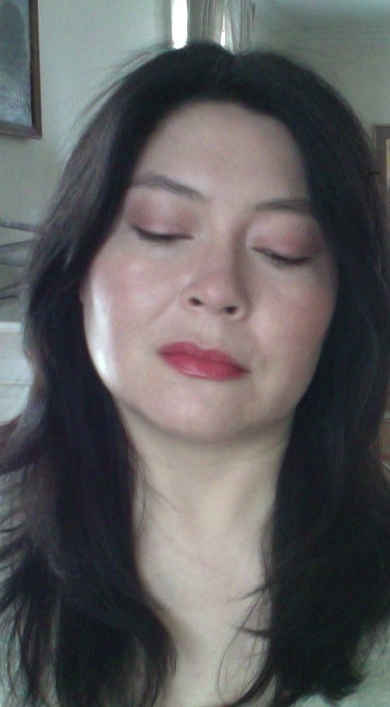 The look with the pink lippy forming a base stain. So, I thought this was…okaaaaay…but I think I underestimated the pink component of the overlying Bourjois gloss stick. The gloss was more pink and less orange than I remembered, so the lip in this case came out looking pretty red. 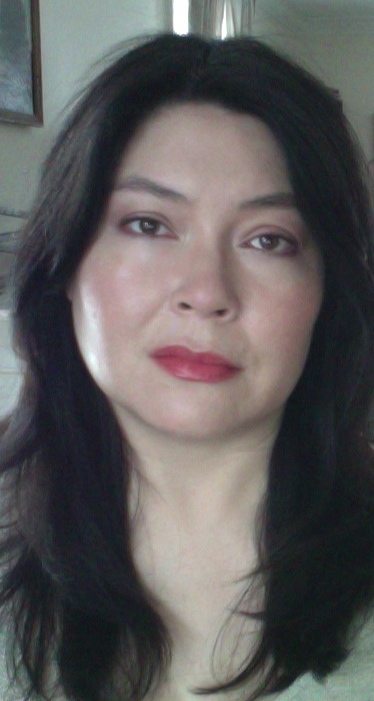 Since I hadn’t really been thinking along those lines, all the rest of my makeup was balanced to the pink side, and I hadn’t been really maniacal about neutralizing all the underlying redness in my skin….so basically, I think that I look a bit tired and perhaps a bit rabbit-y here. Not a total tragedy, just not what I had in mind. 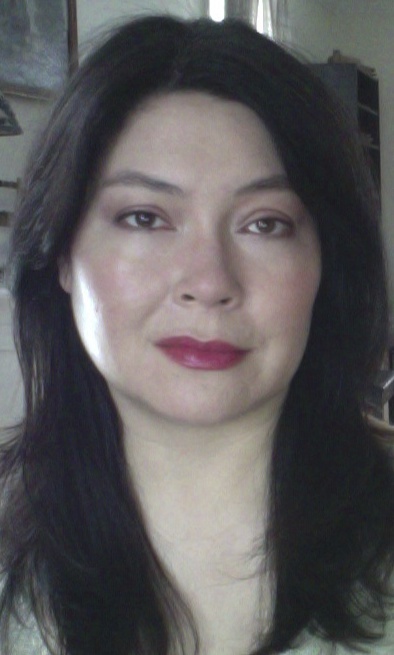 The look with just the Bourjois gloss stick; no underlying pink-lipstick stain. Taking down the underlying pink stain did help matters, I think, but the idea of using a bright lipstick to stain and then applying a complementary gloss stick still intrigues me–I’m going to play more with layering this spring! For the next look in this citrus-inspired series, I’m planning to explore a vintage-inspired look with a satiny, zesty orange lipstick. There’s something really fun and modern about a traditional lipstick finish in a fresh, modern color. So I’ll look forward to sharing that look with you very soon! In the meantime, I hope you have a lovely day. Posted in: Day looks, How did it go?